Located in the northeastern Caribbean, The British Virgin Islands are known for their beauty and calm waters. A multitude of excellent anchorages and idyllic islands make the BVI one of the best locations for Caribbean sailing vacations and is one of our largest bases. Tortola, the largest of the British Virgin Islands, is the most developed, however, it remains charmingly reminiscent of the West Indies' past: a quiet, colonial atmosphere. The BVI (British Virgin Islands) have made yacht chartering one of their main industries and we are very proud to be able to offer our catamaran sailing vacations in this island hot spot. We’ll give you the best possible experience you can have in the British Virgin Islands as we take you to some of the popular locations as well as some of the not so popular stops. Virgin Gorda, the second largest island, which is famous for "The Baths'', which have been described by many as the Eighth Wonder of the World. The site is characterized by huge boulders and crystal blue water with a sparkling white-sand beach. Other island stops on this BVI yacht charter include Jost Van Dyke, home to the famous Foxy's and Soggy Dollar Bar, Anegada, which is a very popular location for many sailing charter companies, Peter Island, and Norman Island, where snorkelers and divers can explore the famous underwater caves as a highlight to their sailing vacation. "I will tour Festiva Sailing Vacations whenever the situation presents itself. I've been sailing for about 35 years and this was at the top of my "sailing bucket list." This sailing vacation topped my expectations! Thank you!" "We made 24 stops, snorkeled in lots of nice places, and saw a variety of things on shore. It was just right." "Meals and appetizers were out of this world. Gourmet quality. Always prepared and served without flaw. Plenty of salads, fresh island fruits and fish. Meals included a delicious dessert and if this was not enough to keep your appetite satisfied, there were baskets of snacks to munch on." Powdery white-sand beaches, lush green mountains, and a sheltered yacht-filled harbor characterize the island of Tortola, where the past of the West Indies meets the present of the BVI. The largest island in the chain, Tortola offers a variety of exciting vacation possibilities. The protected anchorages at Brandywine Bay, Cane Garden Bay, Hodge's Creek Marina Cay, Soper's Hole and Trellis Bay are ideal for boaters. Secluded palm-shaded beaches at Apple Bay, Brewer's Bay, Elizabeth Beach, Josiah's Bay Beach, Long Bay Beach and Smuggler's Cove make for excellent swimming and snorkeling. There are also many well-equipped facilities for fishing, snorkeling, scuba diving and horseback riding. Wander through centuries-old ruins such as the Dungeon, Fort George, Fort Recovery, the Mount Healthy Windmill and Callwood's Rum Distillery, which is still in operation, and explore Tortola's history at the BVI Folk Museum in Road Town. Main Street in Road Town, the capital city, has an array of shops and restaurants; offering everything from local spices, jams, rums, and soaps to handcrafted jewelry, silk-screened fabrics, and local art. Escape to the cool slopes of Sage Mountain National Park, where traces of a primeval rain forest can still be seen at higher elevations. On the mountain ridge that runs through the island, observe local Caribbean life with its gentle rhythms, farms, settlements and churches. At Mount Healthy National Park and Queen Elizabeth National Park, rock outcroppings and vertical ghuts, or dry steam valleys, expose the deep, rich earth of this volcanic island. In Road Town, the J.R. O'Neal Botanic Gardens offers peaceful walks through pergolas and pathways covered with colorful vines, as well as a miniature rain forest and a fern house. The dramatically shaped island of Virgin Gorda reminded Christopher Columbus of a reclining woman, so he named it Virgin Gorda, the "Fat Virgin." The third largest island of the BVI, Virgin Gorda measures eight and a half square miles. In addition to the sheer beauty of the island, travelers are drawn to Virgin Gorda for its yacht clubs, quiet coves, safe anchorages and luxury resorts. On the North Sound, the Bitter End Yacht Club, accessible only by water, offers relaxation in an extraordinary, secluded environment. And with its spectacular setting, Little Dix Bay Resort, designed by Laurance S. Rockefeller, has its own spectacular setting. Your privacy is ensured at one of Virgin Gorda's deserted pristine beaches, such as Savannah Bay, Pond Bay, Devil's Bay, Mahoe Bay and Spring Bay. Or visit the most popular natural attraction in the BVI, The Baths, where huge granite boulders create mysterious grottos, saltwater pools and a connecting trail that entices visitors to spend a day exploring, swimming, and snorkeling. 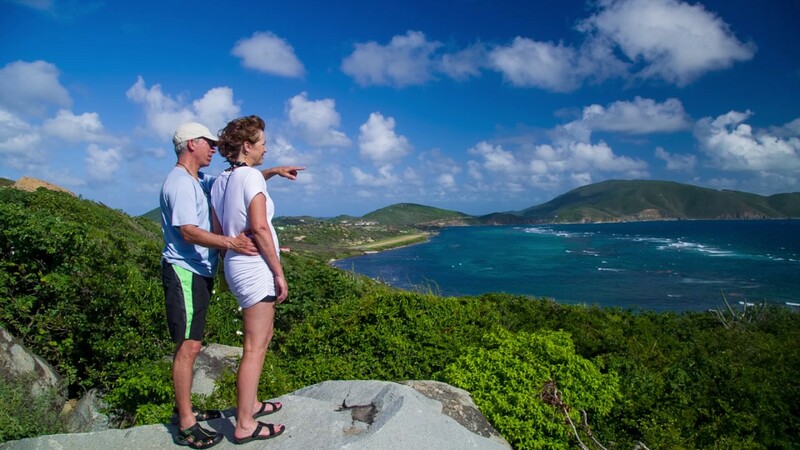 Explore Virgin Gorda on the rugged trails that run throughout the island, and see the huge variety of unique indigenous plants that thrive in the national parks at Gorda Peak, Devil's Bay, Spring Bay and the North Sound. At the nature sanctuary at Little Fort National Park, marvel at the exotic birds as they swoop over the hills and ocean. Not surprisingly, Virgin Gorda has been luring people for centuries. Discover the island's African and Indian heritage; trace its Spanish history at the ruins at Little Fort National Park; observe the British influence in Spanish Town and at the Cornish Copper Mines on the island's southwestern tip, where ruins stand sentinel against the azure sea. Experience the island's exquisite cuisine, a wonderful combination of all its influences, and explore the variety of shops offering local arts and crafts, as well as gifts, resort wear and souvenirs. Jost Van Dyke has fewer than 200 inhabitants and they are widely known as a welcoming people. The island's name conjures up its rich, colorful past. Jost Van Dyke is said to have been named for an early Dutch settler, a former pirate. Although it measures just four miles by three, with the highest point at 1,054 feet, this rugged island has been home to many people, including the Arawak Indians, Caribs, Dutch, Africans and British. At Great Harbour, Little Harbour and White Bay there are safe, protected anchorages and unspoiled beaches shaded with coconut palms and sea grape trees. Discover inviting restaurants, bars, and small shops selling local treasures. For lunch, there are barbecues, West Indian rotis, flying fish sandwiches, grilled fresh fish and lobster. Club Paradise is famous for its conch stew and barbecued ribs. Happy Laury's Snack Bar is known for its pig roasts and honey-dipped chicken. The Soggy Dollar Bar and Gertrude's in White Bay are renowned for drinks made with the island's famous rum, frosty beers and tales of pirates and sunken treasure. Parties here are legendary, especially at Foxy's. This bar and its owner are known to travelers from around the world for the New Year's Eve and Halloween parties, when Great Harbour fills up with yachts. The "Painkiller," one of the most famous cocktails in the Caribbean, was invented at The Soggy Dollar Bar. Explore Jost Van Dyke's history in the vegetation-covered ruins of centuries-old sugar mills, or on the old trails that crisscross the island. William Thornton, architect of the U.S. Capitol Building, was born on Jost Van Dyke, and John Lettsome, founder of the London Medical Society, was born on neighboring Little Jost. In the autumn and winter, observe whales and dolphins from a peaceful hilltop, or visit the East End of the island where you can relax in the natural Jacuzzi formed by the foaming seas. Little Jost and Sandy Cay are a short boat ride away, and on nearby Great Tobago you'll find extraordinary advanced dive sites and a marine sanctuary that shelters a nesting colony of magnificent frigate birds. The only coral island in the volcanic BVI chain, Anegada is definitely unique. The Spanish named it Anegada, the "Drowned Land." Measuring 11 miles by three, its highest point is just 28 feet above sea level. The island is surrounded by Horseshoe Reef, the third largest continuous reef in the Eastern Caribbean at 39 miles long, containing both a patch reef and barrier reef. Cow Wreck Beach, Flash of Beauty, Bones Bight and Windlass Bight are but a few of the beautiful beaches where you can relax under the shade of a coconut palm or seagrape tree. The secluded, powdery white-sand beaches are protected by the sheltering reef and the points that sweep out from the shore: Nutmeg Point, Setting Point and Pomato Point. Bubbling up from the coral bed, clear springs support a variety of wildlife. Loblolly, sea grape, frangipani and the turpentine tree flourish here, along with feathery sea lavender and wild orchids. Saltwater ponds, mudflats and mangrove swamps are home to an array of exotic birds, including sandpipers, ospreys, terns, kaloo birds, blue herons and frigate birds. In the ponds near Nutmeg Point, flocks of flamingos gather. On the nature trail at Bones Bight, catch a glimpse of the rare rock iguanas' native to Anegada. For snorkelers, the reef offers a maze of tunnels, drops and caves boasting a rich marine life. Schools of mojarra and needlefish thrive in the sandy bottoms, while green sea turtles swim in the sheltered waters. Beyond the reef, spectacular sights await scuba divers. Angelfish, stingrays, triggerfish, parrotfish, blue tang and horse-eye jacks inhabit the drowned holds of the numerous Spanish galleons, American privateers and British warships that have been wrecked here. Anegada has all the facilities needed for most water sports, as well as bone fishing and sport fishing. On land, you can read the island's history in the maze of stone walls that surround the Settlement, the main town. In the East End, ancient conch burial mounds and islands attest to the presence of the Arawaks, who called Anegada home nearly a thousand years ago. At the Anegada Museum, maps reveal the location of over 200 wrecks, while cannons, musket balls and ships' timbers are part of the recovered booty. Listen to tales of buccaneers, drowned ships and hoards of gold still undiscovered. Once you arrive in Anegada, there are taxis that will take you to the various spots. At restaurants, visitors dine on lobster, reputed to be the Caribbean's best, or relax with one of the island's special rum concoctions - the Rum Teaser or Wreck Punch. Aragorn’s Studio offers abundant creative energy featuring pottery and local art centre situated at the heart of Trellis Bay Village, BVI. His dedication to the cultural arts are blossoming in a centre where his own works are displayed in amongst the works of the top artisans of the Caribbean and where craft skills are taught to all comers. There are more than 60 islands in all, whose names reflect their colorful past. Among these are Buck Island, Fallen Jerusalem, Ginger Island, Great Camanoe, Round Rock and Scrub Island. While on charter you'll soon discover pristine palm-fringed beaches, rugged peaks and rich vegetation. Some islands are uninhabited and designated as national parks. Can I fish in the British Virgin Islands? A myriad of weather factors is carefully considered before we ask yachts to return to the base and this could happen at any time, should the base decide it to be necessary. We do take precautionary measures so we can insure the safety of all our guests. During severe weather, guests are not allowed to remain on board, however, when on charter, the crew carefully monitors the weather and stays in contact with the base always. In the unlikely event that extreme weather conditions occur, Festiva Sailing Vacations will make the decision to recall yachts to the base or delay charter starts. Guests who have purchased a Trip Insurance Protection plan through CSA Travel Protection are eligible for trip delay reimbursement based on the plan. Truly the sailing Capital of the Caribbean! You can fly into Beef Island on Tortola or the more popular St Thomas Airport and hop aboard the Charlotte Amalie ferry for a scenic ride over to Tortola. Your catamaran "home" will be Hodges Creek Marina, just a taxi ride away from the ferry dock. For early arrivals, guests can stroll around Road Town, where you can visit the local shops or enjoy a bite at one of the local restaurants. Upon boarding, you'll enjoy cocktails while watching your first Caribbean sunset followed by a delicious dinner prepared by the yacht's chef. The Caves on Norman Island, a short sail across the sheltered Sir Frances Drake Channel, bring you your first experience with the beauty and splendor of the BVI. The snorkeling here will make you feel like you are inside an aquarium, teeming with thousands of the most colorful fish. Your crew will explain the history of these caves and the treasure troves that have been found here! A five-minute motor around the headland will bring you into "The Bight" on Norman Island. Begin your second day with freshly brewed coffee, a wonderful breakfast and perhaps a plunge off the back deck. You will sail along the coast of Peter Island, past Dead Chest Atoll and into Salt Island, in protected and calm waters. Peter Island is also the new home of the famous "William Thornton," a floating bar and restaurant known to many as the "Willy T". Salt Island is the graveyard for the R.M.S Rhone which was shipwrecked off its Eastern point with all passengers onboard in 1896. This is one of the most famous wrecks in the world for scuba divers to explore. Snorkel over the stern section or take a walk around the shoreline in search of buried treasure. Next, you sail to The Baths, a national park located on Virgin Gorda. Walk through the batholitic granite caves and formations to Devils Bay where your crew will meet you with a refreshing, packed cooler and your snorkel gear. We enjoy lunch back on the boat and then off we go for an hour's sail up the spectacular coast of Virgin Gorda and The Bitter End Yacht Club. Go ashore after dinner and take in a typical BVI evening with your favorite Rum Punch and Steel Drum Band. Today we hoist all the sails and set our course for the two-hour cruise to the flat coral-sand island of Anegada with its endless white beaches. Feel the "talcum powder" under your feet while you stroll along the deserted beach. With the third largest barrier reef in the world surrounding Anegada, today is the perfect day to relax on the beaches of Loblolly or Cow Wreck Beach and enjoy great sites and fantastic snorkeling. Tonight, is your first night dining ashore. The prolific lobster population of this Island ensures a lobster meal second to none. Choose your lobster and watch it sizzle on the beach BBQ in front of the Anegada Reef Hotel or select a meal from the specials of the evening. Another super sail back to Mountain Point on Virgin Gorda where we stop for lunch and fantastic snorkeling amongst the granite boulders. From here, we sail through the Dog Islands to Marina Cay, a private Island Resort off the East side of Tortola. Michael Bean will entertain you with Pirate songs with his guitar and harmonica during happy hour on the top of the island. Dinner on board and a good nights' rest in this calm anchorage will prepare you for the exciting day ahead. After coffee, we move to Monkey Point on Guana Island for breakfast. A snorkel around the unusual coral outcrops will reveal some strange marine creatures not often encountered. Lunch is at a unique little Islet off the Island of Jost van Dyke. With a good coverage of shade and a few palm trees, walk around this Island in just five minutes and snorkel the surrounding coral reef. Its nearly happy hour time at the world famous Foxy's on Jost van Dyke. Pin up a garment of clothing with your name written on it in Foxy's bar to join the many hundreds from all over the world. White Bay, just around the corner from Foxy's, is a spectacular strip of white sand fringed with coconut palms. Put your dollars into your pocket and swim ashore to the Soggy Dollar Bar, where the original "Painkiller" cocktail was conceived. We spend a leisurely day here before returning to Tortola, checking in at the famous Soper's Hole. This is the last night where you will dine ashore and enjoy late evening entertainment. After breakfast, we take a short cruise around to our base. Joyful memories and new made friends, we wish everyone farewell until the next cruise with us.